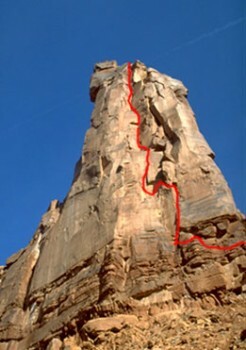 Primrose Dihedrals is a free route up the southeast face of Moses, a striking tower in the heart of Canyonlands National Park. It offers steep, varied climbing, mostly solid rock, and a spectacular remote setting—one of the most rewarding routes you will ever do. Which SuperTopo guidebooks include a topo for Primrose Dihedrals?